On Saturday, the Senate made the historic decision to repeal “Don’t Ask, Don’t Tell,” which led to plenty of celebrities tweeting their excitement and patriotic pride. “Modern Family’s” Jesse Tyler Ferguson wrote, "Stepping closer to Equality! Good Job America!!!! Don't Ask Don't Tell closer to being on the 'Remember-how-crazy-it-was-when...' list!" Meanwhile, Kathy Griffin tweeted “FINALLY! Equality IS coming" in response to a follower asking her to talk about the news, and then tweeted another: "Reflecting on a historic weekend in fight for equality. Our national security & humanity will be stronger without #DADT." Whose celebrity split is the most shocking?! There are three big couples in final contention for the most shocking split of 2010: Courteney Cox & David Arquette, Sandra Bullock & Jesse James, and the most recent one, Eva Longoria & Tony Parker! I gotta say, I think that Sandra and Jesse's split was the most shocking because of the way it went down. I also thought they made a good couple, despite so many people saying that they never saw them together as a pair in the first place. What do you think? Would you say Sandra and Jesse's break-up was the most shocking split of 2010? Post your comment below. Lady Gaga's "devastated" about her rescheduled performance in Paris, and Neil Patrick Harris got into a Twitter row with actor Eric Braeden. If ABC ever reverts to a monarchy (and really, why wouldn’t it? 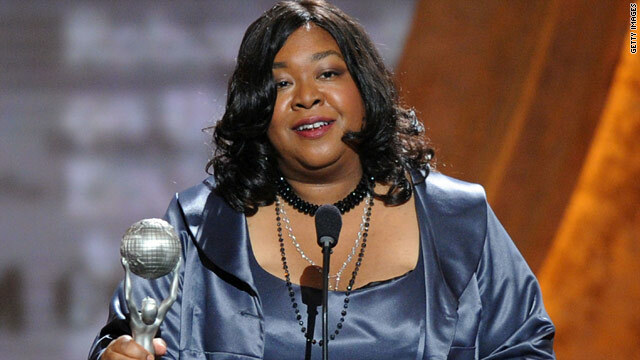 ), Shonda Rhimes will be queen. She’s known best as the creator of “Grey’s Anatomy,” which is in its seventh season and the spin-off, “Private Practice,” which is in its fourth. The writer/executive producer is also getting ready to reap in the rewards of her new drama, “Off the Map,” that premieres on January 12. Adding to her royal duties will be a yet-untitled project for 2011 that ABC just gave her the go-ahead to produce. Actor Vince Vaughn and country music star Jay DeMarcus of Rascal Flatts are both proud new papas of baby girls – the new dads each welcomed their arrivals over the weekend. DeMarcus's daughter was born in Nashville, Tennessee on Friday, and he and his wife Allison - who have been married since 2004 - named her Madeline Leigh DeMarcus. After Shania Twain's public heartbreak in 2008, the country music sensation is finally ready to say "I do" again. Twain’s rep confirms to CNN that the singer is engaged to Frederic Thiebaud. According to Us Weekly, Thiebaud is the ex-husband of the woman that Twain’s husband of 14 years, Robert "Mutt" Lange, allegedly left her for in 2008. Yes, Denise Richards has confirmed that she’s been spending time with Motley Crue musician Nikki Sixx – but it’s not as serious as some may think. But, she added, "The God's honest truth is we're taking it very slowly."